SA plans to intercept the GX train, and they planted a bomb, the train carries civilians and important people. Your mission is to defuse the bomb. Get through the baddies by shooting them. Make sure you don't shoot any civilians. Shoot - Left Click, Change Weapon - Click Weapon on the Right panel, Reload - Move mouse down. You need to cut Mr. Nobuyuki off his political influence. Sneak into his hideout on an island in the Pacific Ocean, shoot down all the guards who cross your path to proceed further. Press SPACEBAR to come out and use YOUR MOUSE to aim and LEFT CLICK to shoot. Dont forget reloading, when your magazine is empty. 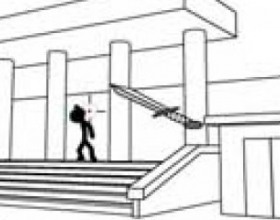 In this game a small man is fighting alone with dozens of enemies and he has to shoot really fast to stay alive and be careful while bullets and heavy objects are flying at him. Press space bar to reload your weapon. Lou Bega – Mambo Nr. 5 song parody. Two Chinese cooks have changed this song to advertise their restaurant and to attach more clients. This is song about their tasty and cheap food which they can deliver very fast. China is a very old and enigmatic country. Its traditions, customs and mentality are very interesting and sometimes hard to understand to foreigners. But computer games, which use Chinese storylines, are extremely popular among gamers of all nationalities, as they present something quite different from their usual gaming experience. If you like action games, try to play "Time Bomb". The appellation speaks for itself. In this game you will have to prevent a terrorist attack. A group of terrorists plans to capture a train, where civilians as well as persons of the state importance, are travelling. Your mission is to defuse the bomb. Get through the baddies by shooting them. Be very careful – make sure you did not shoot any civilians. Politics means complicated affairs, which can sometimes lead to different consequences. In Nobuyuki Forces 3 you are going to cut Mr. Nobuyuki off his political influence. But that is not easy, as his precise whereabouts are not known. You only know that he is hiding on one of the islands in the Pacific Ocean. So you have to find him, sneak into his hideout, shoot down all the guards, who cross your path, to proceed further. Press space bar to come out and use your mouse to aim and left click to shoot. Don’t forget reloading, when your magazine is empty. If you like playing shooters, this game will suit you. In Fight 4 a small man is fighting alone with dozens of enemies and he has to shoot really fast in order to stay alive, and be careful while bullets and heavy objects are flying at him. Press space bar to reload your weapon. Like food games? Feel like getting closer to the world of restaurants and delicious cuisine? In Combo Nr.5 making food is also funny. 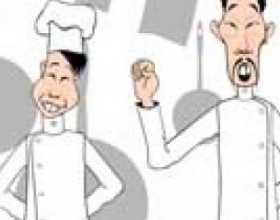 Two Chinese cooks have created many songs to advertise their restaurant and to attract more clients. These songs are about their tasty and cheap food which they can deliver very fast. Chinese games are also famous for their interesting puzzles, riddles and arcades. These are excellent for those gamers who want to train their brains, develop logical thinking, memory and concentration. Chinese puzzles are usually accompanied with pleasant national Chinese music and beautiful design. You can find Chinese games online. Visit our page and join the vast community of gamers.